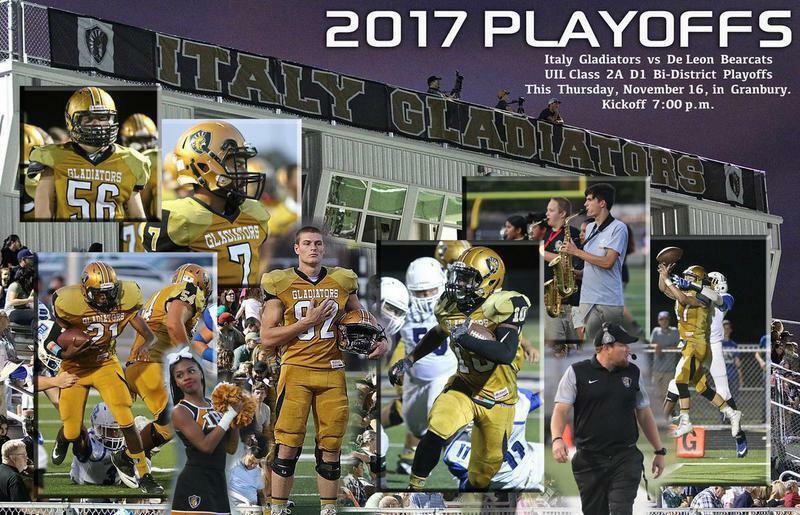 The mighty Italy Gladiators (5-5,2-3) will challenge the De Leon Bearcats in the UIL Class 2A D1 Bi-District playoff round this Thursday, November 16 in Granbury. Kickoff is set for 7:00 p.m.
Senior defesnsive end #82 Clay Riddle leads the Gladiators with 101 tackles, including 85 solos. Sophomore inside linebacker Donald Hayes has recorded 86 tackles with 73 solos and outside linebacker #13 Caleb Telatnyk 85 total tackles with 65 solos. Leading the Gladiator offense is junior quarterback #7 Marcos Duarte who will rely heavily on senior receiver #9 Gary Escamilla who has a TD reception while totalling 30-yards with 2 catches on the season. Duarte has completed 11-out of-23 passes for 211-yards for an average of 19.2 yards per catch. He has also completed 2 touchdown passes and has a quarterback rating of 69.6. Senior receiver #1 Devin Mapps could be a factor in this one also after recording 45 receiving yards on 3 catches. Expect senior tailback #10 Kendrick Norwood to continue being the go-to weapon for Italy head coach and athletic director David Weaver. Norwood has rushed for 1,749 yards thru 10 games with 213 carries for an 8.2 average. Norwood averages 174.9 yards per game and has tallied 19 rushing touchdowns to help return the Gladiators to the playoffs. Also capable of carrying the rock for Italy is freshman running back #11 Daylon Slade whose rushed for 587 yards on 76 carries with 5 rushing touchdowns to his credit. Senior back #21 Anthony Lusk has rushed for 2 touchdowns this season and is an impact player on special teams. THSCA and District passes will be accepted at the gate.